We have all heard the saying, "An apple a day keeps the doctor away." 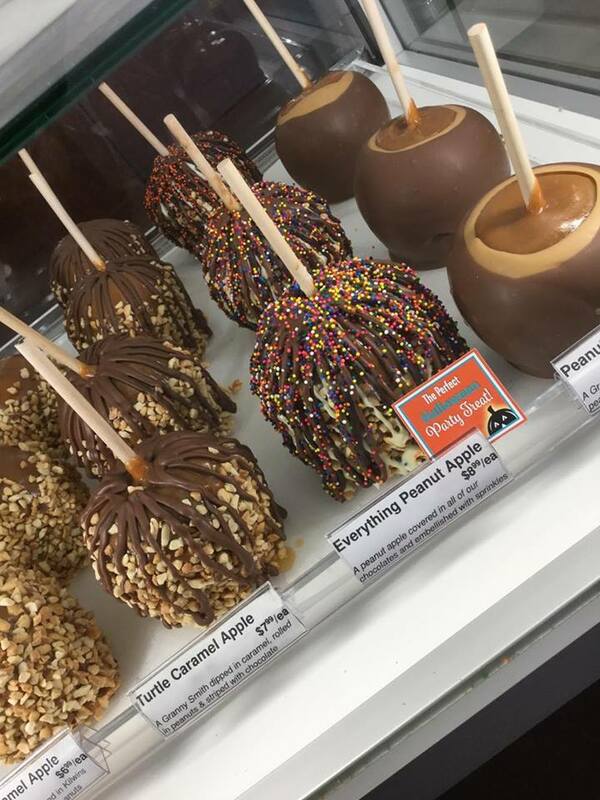 However, when you see, smell and taste the carmel apples of Kilwins at Broadway at the Beach, you (regardless if you're a doctor or not) won't be able to stay away! 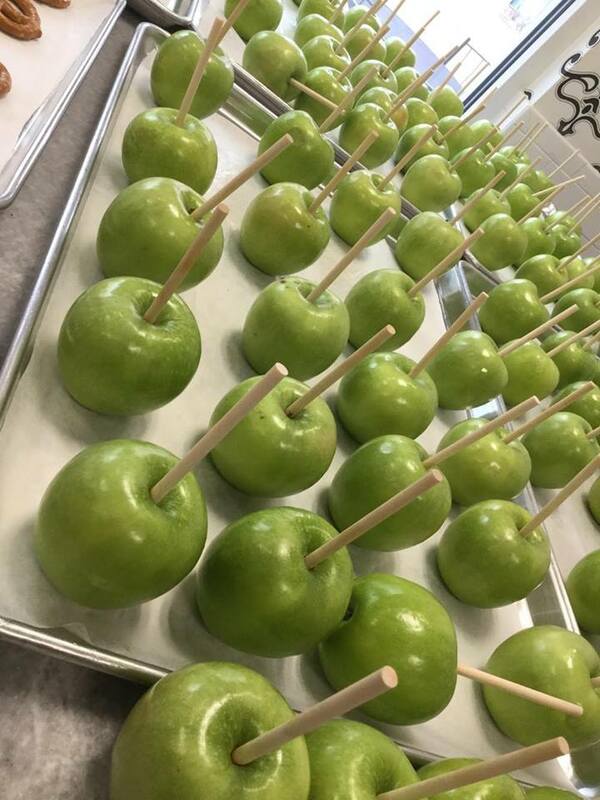 We recently took a tasty course in carmel apple making and we enjoyed every sight and bite of our edible education and we're sharing it with you! Step one: It isn't just any apple! 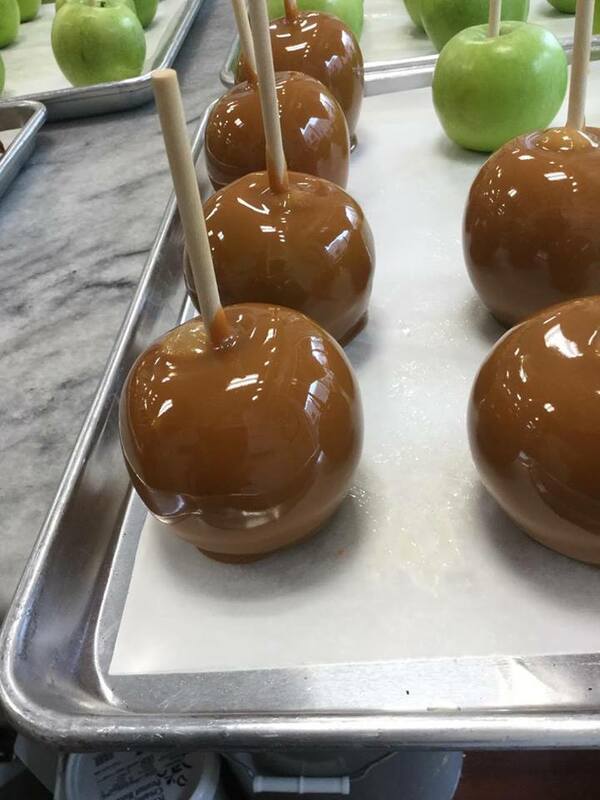 There's no mistaking the crisp and tasty tartness of the Granny Smith apple and when it comes to Kilwins' carmel apples, perfection is key! Each apple receives a stick, the essential tool to adequately enjoy the dipped delight! Step two: Create the carmel! 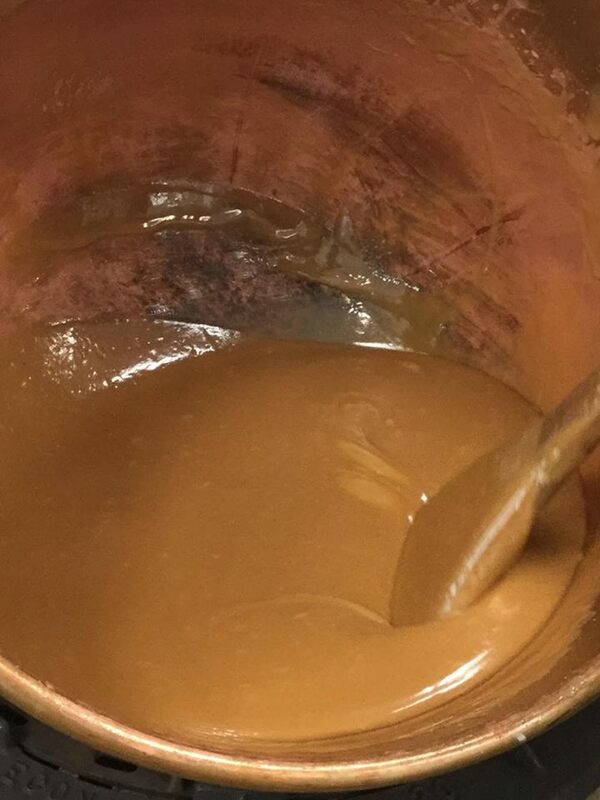 The blanket of hot, smooth carmel for each apple begins in a deep copper kettle where cream powder is added to hot water, followed by sugars, salt and butters all stirred and wire whisked until everything is completely dissolved. From this point, the stove is turned on high and Paige (our Carmel apple chef extraordinaire) starts the constant stirring process! Once the batch begins to boil, then comes the stream of evaporated milk, but not added too quickly so as not to disrupt the boiling. Again, Paige continues to stir to ensure the sweet liquid treat doesn't burn on the side of the kettle! Now back to the carmel apples. Once the carmel creation is near completion, the stove is turned off, but the stirring keeps going to allow for cooling. Once a cooler temperature is reached, vanilla is added and stirred and voila, the carmel is now ready for the dipping! It's the main event we have been patiently waiting for. Okay, not that patient because we did sneak a sample (or two) while watching Paige do all of the work! Step Three: Let the dipping begin! Each apple is then dipped, and completely submerged into the sweet, shiny and oh so delicious carmel. 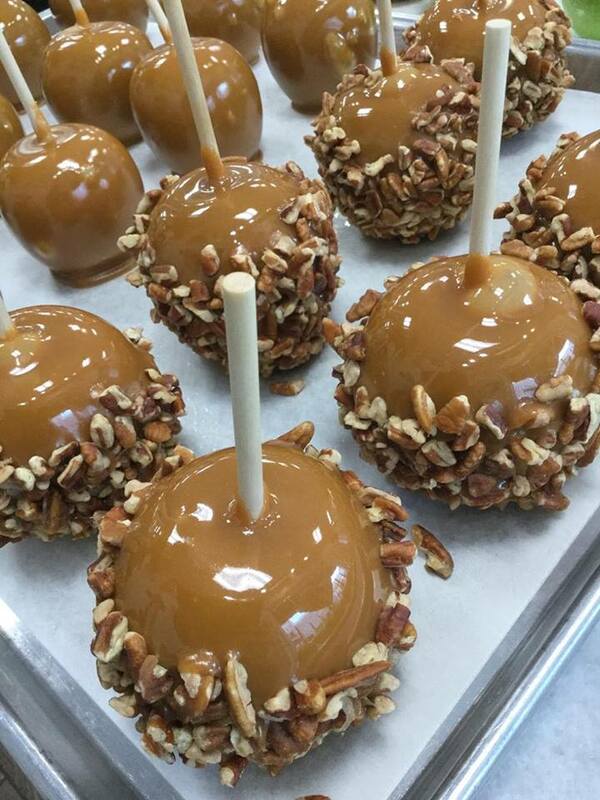 The first of the dipped apples were for the simple carmel apple lovers! But for the other tasty treat lovers, there are the toppings! Just when you thought carmel apples couldn't get any better, Paige starts to dip the rest of the carmel apples in chopped peanuts and pecans! And we're not talking about a few pieces of peanuts and pecans, the whole apple is covered in the nutty goodness! Click here to see how it is done! Once dipped and coated, each apple is placed on parchment paper to set. 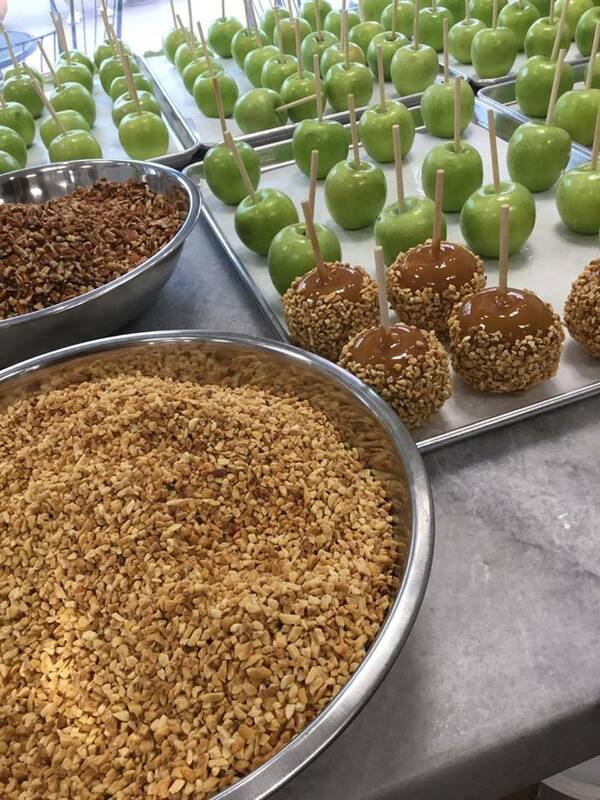 As a spectator, the waiting to set process may be the most difficult to endure as the magnificent masterpieces of Kilwins carmel apples are just waiting for our impatient palettes to partake! Okay, so the wait isn't that long. But when you have smelled the heavenly scents of fresh fudge, cool ice cream and perused through the other sweet treats of Kilwins, we were finally ready to taste! It was certainly worth the wait! 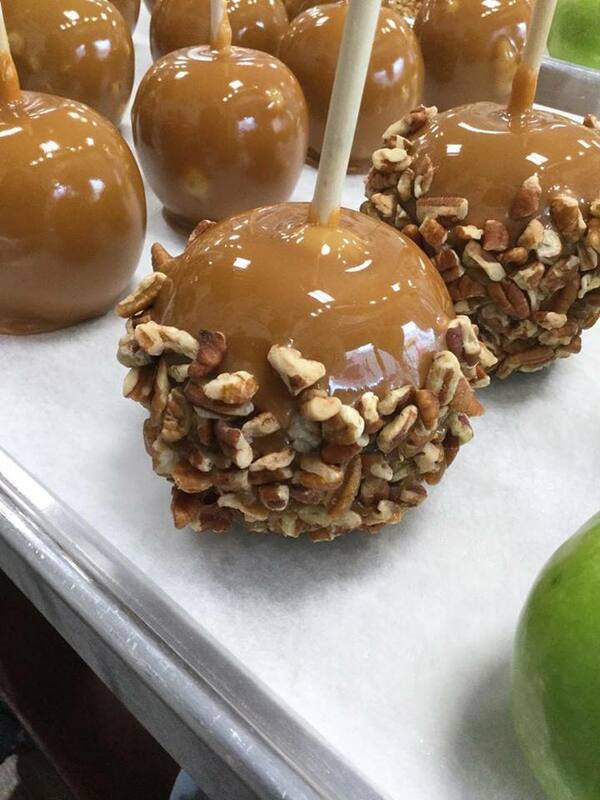 The Kilwins carmel apple creations don't just stop with peanuts and pecans, they also make other tasty varieties of the carmel apple, including Turtle Carmel Apple, M&M Carmel Apple, Stripped Carmel Apple (it includes chocolate… oh yeah), Apple Pie Carmel Apple, Sea Salt Carmel Apple, and the list goes on! So as our Kilwins visit came to an end, we were left sugared, sweetened and abundantly satisfied! Now we have just one more question for our Broadway visitors, How about them apples? Let’s Eat, Drink & Play at Dave & Buster’s! It's the place for thrilling games, great food and good times all under one roof! And on this visit, we sipped, dipped and enjoyed every bite of our lunch at Dave & Buster's! From shareables, crafted cocktails and brews, soups, salads, surf & turf, burgers, delicious dinners and delectable desserts, the huge menu offers a wide variety of taste bud tempting delights! Want to see for yourself, click here for their menu. While our party of three was surfing through the menu, we decided to go ahead and dive into a delicious appetizer, but not just any appetizer, their Triple Play featuring classic buffalo wings, crispy mozzarella sticks and seasoned tots with warm queso, bacon and green onions on top! It may have been a triple play, but we only needed one word to describe it, AWESOME!!! Now it's on to our individual orders! As mentioned, there is a plethora of choices to choose from and somehow, we narrowed it down to the South Philly Burger, the Bang Bang Chicken with Spicy Thai Peanut Noodles and Mediterranean Hummus! You can say each of us were craving flavors from across the world, and Dave & Buster's deliciously delivered! First, taking us to the south streets of that Pennsylvania town, the half-pound South Philly Burger is piled high with thinly sliced steak, and then topped with peppers, onions, mushrooms and melted American cheese on a toasted brioche bun. Honestly, need we say more? Actually, we do because we cannot forget about the half a pound of crispy seasoned French Fries that went along with it! Now off to Thailand. Imagine this: tender crispy boneless chicken tossed in a mouthwatering Bang Bang sauce served on a bed of noodles and then tossed with Asian vegetable and peanut sauce! You don't need to imagine it, you just need to try it because we are so glad we did! For the spicy lovers that want to kick it up a notch, you can even request some Siracha sauce to top it off. However, we weren't that brave, but with or without the extra heat, for lunch or dinner this dish is a must try! Now for our third lunch companion, their choice took us overseas with Dave & Buster's Mediterranean Hummus. The classic favorite served with Greek tzatziki dip, warm grilled pita bread and even some fresh veggies for dipping! A cooler dish to round out our Dave & Buster's lunch treat! Great eats, cold drinks, games for the watching and games for the playing, what could be better than that for our mid-day getaway? Answer: Enjoying them under one roof on The Avenue at Dave & Buster's all at Broadway at the Beach! It's hard to believe, but October is here and with it comes lesser humidity, more pumpkin flavored options and new ways to experience fall at Broadway at the Beach! From the classics to today's latest models, car enthusiasts will be revvin' their engines at not one, but two car shows at Broadway. On Saturday, October 7th, Broadway at the Beach will host the Coastal Carolina Mustang Club's 7th Annual Grand Strand Stampede. From 8am to 4pm, around 350 Ford Mustangs of yesteryear and today will be vying for bragging rights and awards. The following week, from October 12th through October 14th, Broadway at the Beach will host the Cruisin' the Beach car show also featuring a variety of vehicles. This three-day event features vendors, 50/50 ticket sales and awards! Both events are held in the overflow parking lots near Broadway movie theatre. This October will also bring awareness to two charitable organizations at Broadway. 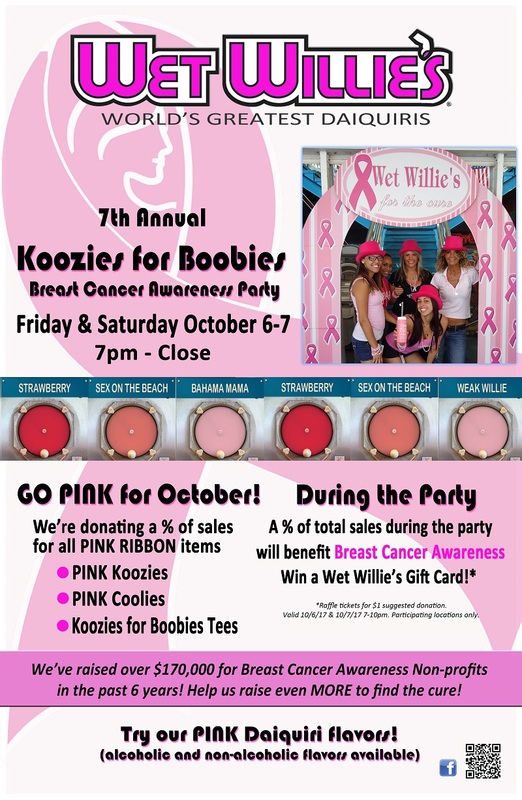 All month long, Wet Willie's will feature their breast cancer awareness campaign, where a portion of pink drink sales will benefit the Susan G. Komen organization and on Friday, October 6th and Saturday, October 7th, Wet Willie's will hold their 7th Annual Koozies for Boobies Breast Cancer Awareness Party. For more information on this event, click here. On Saturday, October 14th, the American Foundation for Suicide Prevention will hold an Out of Darkness Walk. 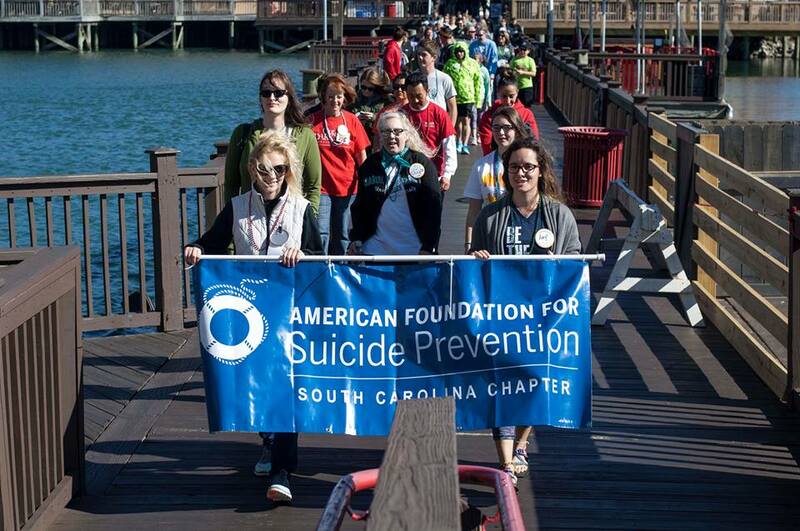 With registration beginning at 10am and an opening ceremony at 11am at the Heroes Harbor stage near Jimmy Buffett's Margaritaville, this 1.5 mile walk through the villages of Broadway raises funds for suicide prevention in South Carolina and across the nation. This October, along with their everyday rock memorabilia and delicious drink and eats options, Hard Rock Café will feature live music on various nights and every Saturday, you don't want to forget your dancing shoes as you enjoy Salsa Nights with DJ Alberto! Not an expert when it comes to salsa dancing? That's no problem as free dance lessons are available starting at 10pm! Now we couldn't mention October without talking about Halloween! The Grand Strand's largest Halloween Bash will be held Saturday, October 28th along The Avenue at Broadway! It's the one night of the year where ghosts, zombies, superheroes, animals and movie stars roam around The Avenue (okay, not actual ghosts, superheroes and movie stars, but Halloween enthusiasts dressed up as them) all competing for 1st, 2nd and 3rd place in the annual costume contest! 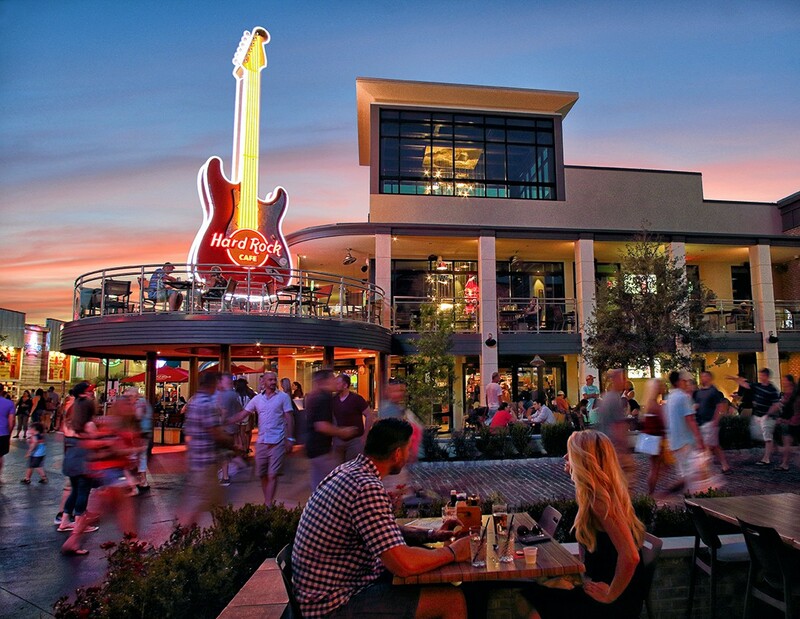 Whether you dress up or dress down, come and enjoy live music, entertainment and more all beginning at 7pm! For more information on this event, click here. 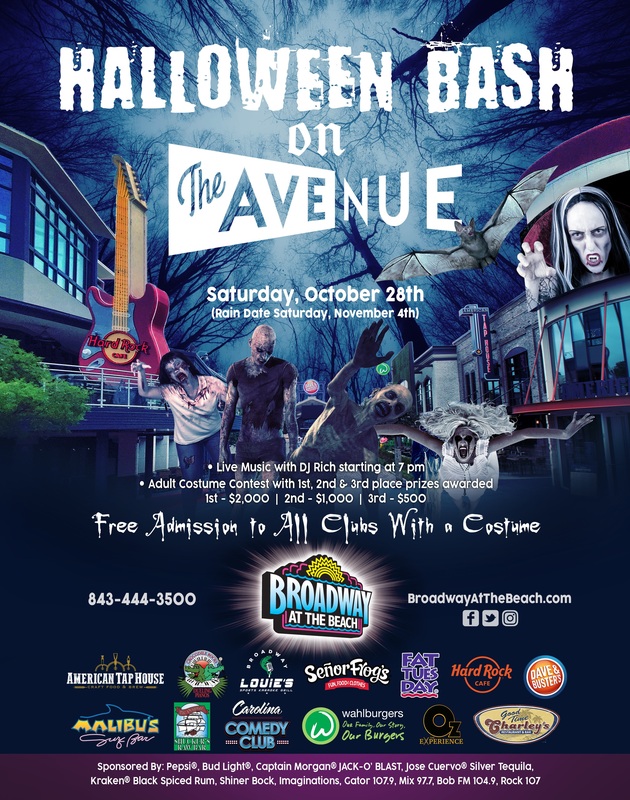 Although the Halloween Bash on The Avenue is geared more towards the adults, the little ones can enjoy two trick-or-treat events at Broadway, or, one trick-or-treat and one truck-or-treat! On Saturday, October 14th from 10am to 2pm, Broadway will once again host The Sun News' Truck-Or-Treat. 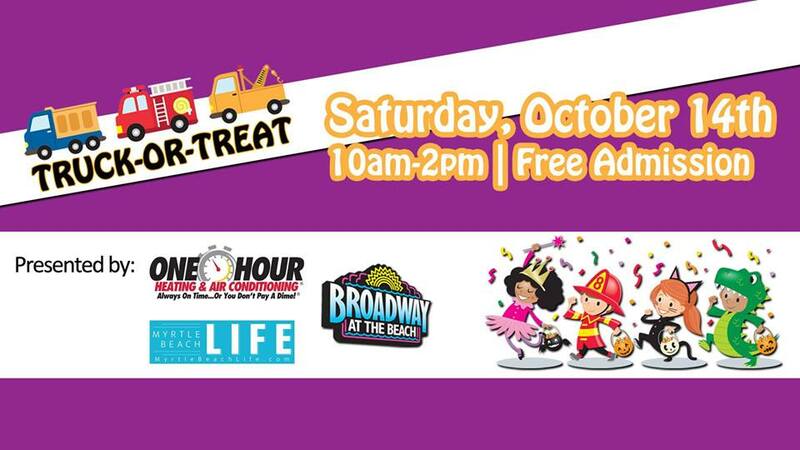 This free community event will be held in the parking lot next to Landry's Seafood House and will feature an interactive experience for kids and their families to check out all kinds of trucks including emergency vehicles, big rigs and more all while receiving candies and other treats! Click here for information on this event. On Halloween night, the little ones can enjoy trick-or-treating throughout Broadway from 4:30pm-6:30pm! After trick-or-treating, you'll want to stick around as we light up the sky with a Fireworks Extravaganza over Lake Broadway at 8pm! As you can tell, October is a busy month at Broadway and we haven't even mentioned the Happy Hour specials and special game day menus of Liberty Brewery & Grill and the All You Can Eat Oyster Roasts at Original Shucker's! You'll just have to experience it all for yourself as you FALL back in love with Broadway all October long!